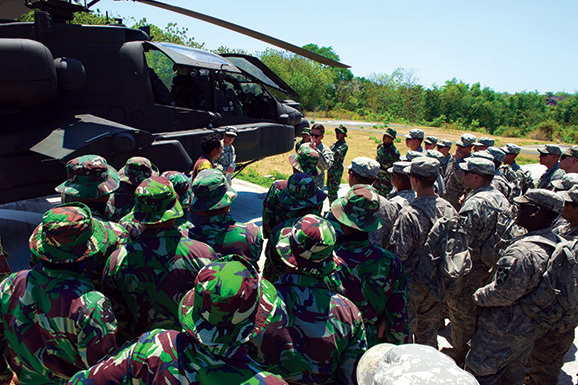 Members of Indonesia’s 411th Raider Infantry Battalion join Soldiers of the 2nd Battalion, 1st Infantry, 2nd Stryker Brigade Combat Team, 2nd Infantry Division, for an AH-64 Apache familiarization brief by Chief Warrant Officer 2 Jake Uber, of the 25th Combat Aviation Brigade, during Exercise Garuda Shield, in Indonesia, Sept. 25, 2014. The exercise was part of Pacific Pathways. Photo Credit: Sgt. Brooks Fletcher. This summer, for the first time, a Pacific Pathways iteration will involve bringing nations from the Pacific region to the United States to engage in exercises Tiger Balm, Arctic Anvil and Rising Thunder. During Pacific Pathways 16-3, for instance, Singaporeans will come to Hawaii for Tiger Balm in July, he said. Canadians will go to Alaska for Arctic Anvil, also in July. And the Japanese will go to Washington State for Rising Thunder in September. Pacific Pathways kicked off its first iteration in 2014, putting existing exercises with partner nations in the Pacific region under one banner and converting them from independent stand-alone exercises into a series of single, lengthy operations, each of which requires more participants, at more levels of command, to practice and demonstrate a much broader set of skills and capabilities than would normally be required during a single, stand-alone exercise. Lanza characterizes Pacific Pathways as an operation that includes multiple units participating in multiple exercises over several months. A Pacific Pathways iteration, he said, is more valuable to participants than the sum of the exercises it includes - which independently were aimed at building relationships and the tactical skills of those involved. A Pathways operation is more than a unit moving from the United States to one nation, and then home again. Instead, a participating unit deploys from the United States to another nation, then to another nation, and then possibly to another nation as well, over the course of several months. They bring their gear and equipment with them, then move into and out of a nation’s ports, and conduct reception, staging, onward-movement and integration operations. They must understand port operations, frequency management, requirements for live fire, and how to move ammunition from the port to the training area. “All of those things have to be worked through,” Lanza said. On top of that, the level of command to conduct a Pacific Pathways operation is deeper than what would be required for a single exercise, he said. Lanza said that during a Pacific Pathways iteration, units might be training in Indonesia and Malaysia, while the command post is in the Philippines. The breadth of what Pacific Pathways provides enriches participant experience and greatly enhances the ability for the entirety of I Corps to train, all the way up to corps level. It has pushed the value of individual exercises beyond development of familiarity between partner nations, Lanza said. “We are beyond relationships. We’re now getting after readiness, both ours and theirs, in an operational environment,” he said. “Pacific Pathways has helped not only our own operational readiness, but has built operational readiness at echelon, from the theater all the way down to the platoons that operate. It’s built joint readiness and it’s enhanced our mission-essential task readiness. Lanza said that Pacific Pathways will grow in other ways too. Total force involvement has grown inside the Pacific Pathways operations. Army National Guard and Army Reserve involvement has increased. But that’s not the only way I Corps is growing its relationship with the Guard and Reserve. I Corps is already training with Guard and Reserve forces at home station, at the Joint Readiness Training Center and at the National Training Center, as well as on Pacific Pathways operations. The 81st Armored Brigade Combat Team, Washington Army National Guard, will be associated with the 7th Infantry Division stationed at Joint Base Lewis-McChord, Washington. The Hawaii-based 100th Battalion, 442 Infantry Regiment, U.S. Army Reserve, will be associated with the 3rd Brigade Combat Team, 25th Infantry Division stationed at Schofield Barracks, Hawaii. The 1st Battalion, 151st Infantry Regiment from the Indiana Army National Guard will be associated with the 2nd Brigade Combat Team, 25th Infantry Division stationed at Schofield Barracks, Hawaii. Will that associated Guard or Reserve unit necessarily deploy with the active unit to a combat zone? Lanza said he thinks so, but that and other questions will be worked out in May at FORSCOM. “I think this initiative to associate Guard and Reserve units with active units, that we train together and build readiness together, is exactly what’s needed for the future,” he said.